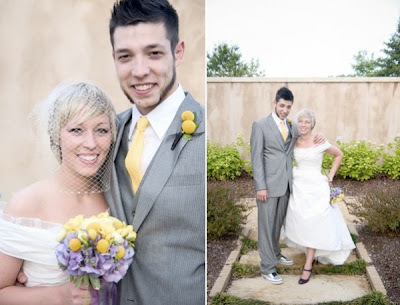 I love this wedding, found today on Once Wed. 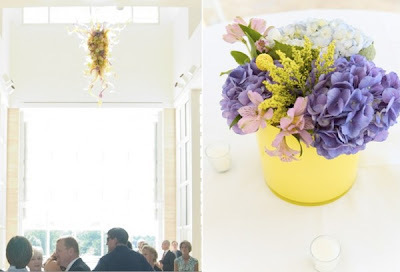 The best part is how the wedding colors were coordinated to match that cool light fixture. 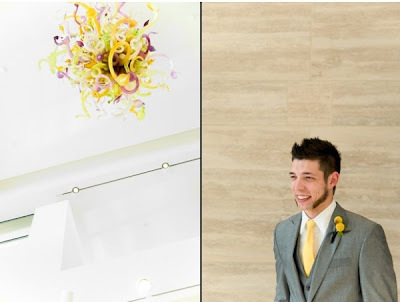 ~loveliness* ...love this colour combo & quite unpredictable for a wedding...fresh! Purple and yellow. I wouldn't have thought to put the two together for a wedding ... but that's because I'm from the land of the Vikings - the football team, which is purple and gold. However, here, removed from that professional sports atmosphere, they are lovely.